If we’ve met in person over the past few months, I’ve probably told you about my trips out on the bay. And I’ve probably said that I’ve seen more of Santander in the past year than I have in the past two decades. 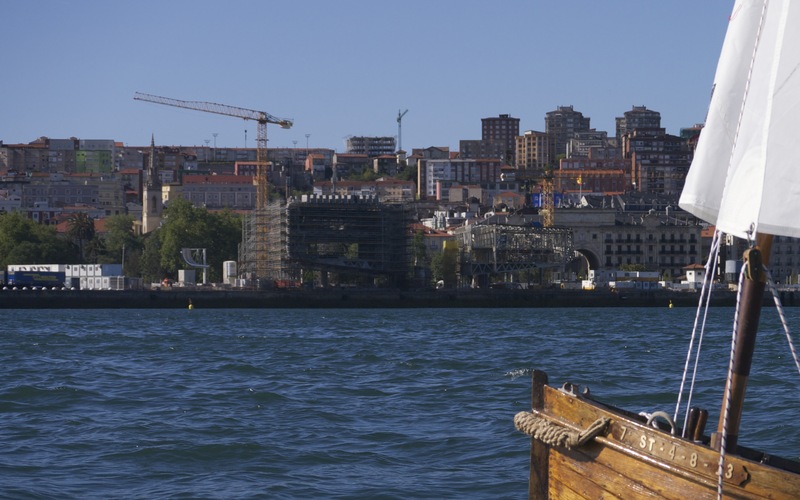 Writing about the city is one of the reasons and rowing an old style boat in the bay is another. I recommend both as a way of really getting to know a place. Of course, if you can plan it properly, you’ll go out rowing on a sunny day and blog about the city on a wet one! Let me show you why I think rowing is such a great activity here. There’s nothing quite like being on the bay with 13 other people for a few hours. In between strokes you not only get to see a bit of countryside and wildlife on the water but you see the city from a completely different angle as well. And you learn a lot from the others on the boat about the area too. Do you want to see the city through these new eyes? 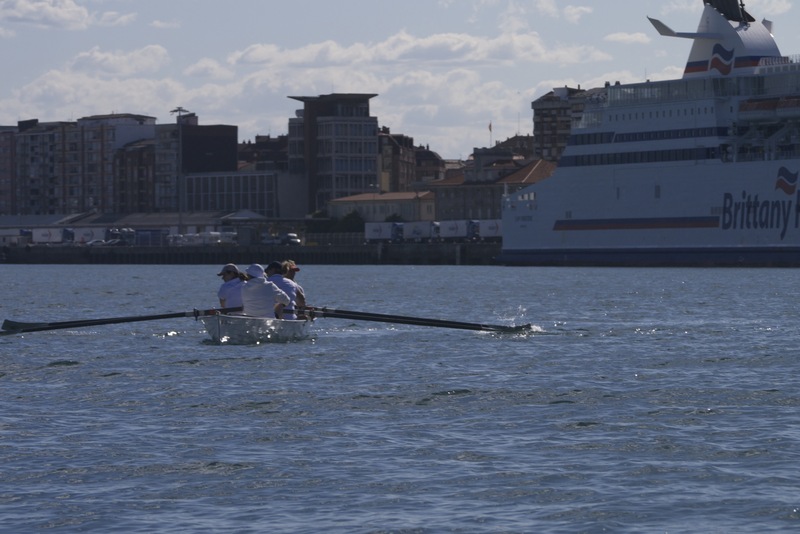 Let me tell you a bit about rowing in the North of Spain. No prizes for guessing that the trainera (pronounced ‘try-nera’ if you’re an English speaker) was made for fishing. Its design – dating back to the middle of the 18th century – meant it was strong enough and large enough to take a decent catch of sardines or anchovies and light enough to be able to return to the port quickly – to sell the goods at the best price. The oarsmen were only paid when the rent for the boat and the fishing net were deducted – so it was in their interest to get a decent catch and take it back into port quickly. At some point along the way these boats started being used for recreational purposes as well. 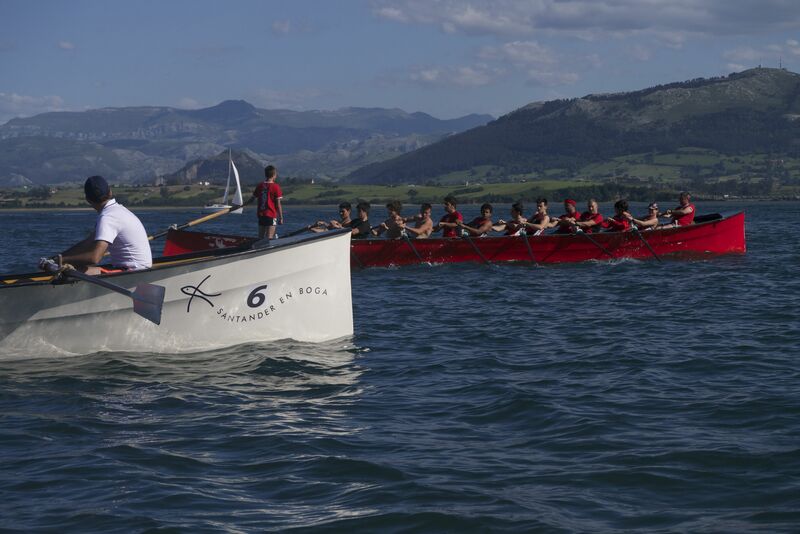 Rowing races were incorporated into village fiestas. By the mid-19th century, the regattas come on the scene. 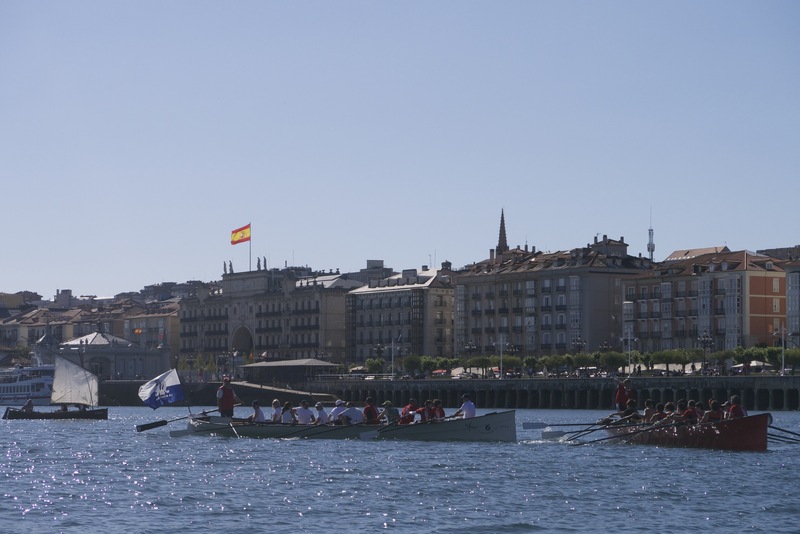 Bandera de la Concha in San Sebastian is probably the best known and most prestigious trainera race today but the oldest regatta (continuously run since its inception) is the Bandera de Santander Race. First held in 1859, it benefitted hugely from the presence of Queen Isabel II in 1861. By this time, rowing was an extremely acceptable sport especially among the upper classes in Britain. The Oxford Cambridge race first took place in 1829 and the Henley Royal Regatta began in 1839. In 1869, the sliding seat was invented and its increased speed led to its immediate acceptance among recreational rowers. By 1900 this modern strand of rowing was included in the Olympic Games and fixed seat rowing, as a sport, was in a precarious place. So here we are in 2014 and traineras are still being made and maintained. It’s a special event (and a very expensive one) when a new boat is baptised. 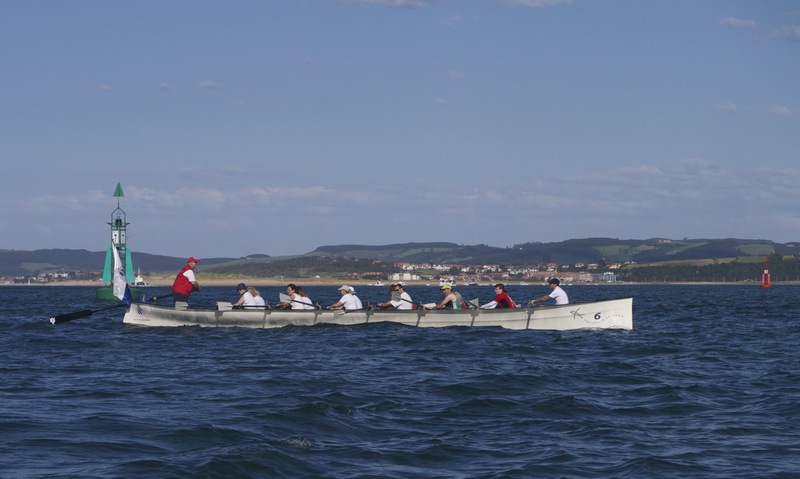 Throughout the Summer months, there are rowing fixtures all across the Cantabrian coast. It’s hugely popular in the Basque Country. I went to see a competition in Mundaka a few years ago and with my new club, we saw la creme de la creme (no, I’m not referring to us) competing in Orio, just outside San Sebastian, earlier this year. 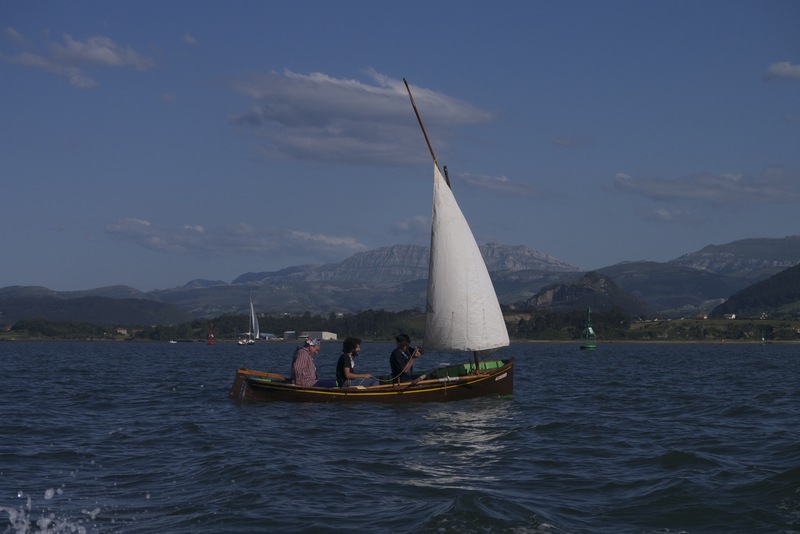 In a few hours time, we’re off to the Basque waters again – to Algorta near Bilbao for Corpus Christi – where we are being treated to grilled sardines after a row around the old port. I should explain that it’s not the first time for me to clasp an oar. My grandfather kept a boat on the lakes at Fossa, Killarney – which has a great tradition of fixed-seat rowing and I remember going to one of the regattas there as a child. It’s probably the reason I joined the Rowing Club at the University of Limerick for a year. Now while Limerick City has a wonderful tradition in rowing, in the 1990s the college club had to beg, borrow and steal, and make do with the likes of a very unfit me. In case you think I’m joking, myself and my three rowing partners were told after our first (and my only) university race in Cork that we’d need a calendar rather than a stopwatch to time ourselves. Thankfully, those days were pre-mobile phones and nobody thought to take a camera along. Everything’s changed now and – the UL club has seven boats, a jetty, an indoor rowing tank with waves plus an array of rowing medals. Two decades on – I’m out again on the water. Different location. My motivations before I hopped into the boat were to get a bit of exercise and enjoy the views of the bay. On my maiden row I did that and much more. It was last September and I needed to lie down for an hour afterwards so I ticked the exercise box straight away. And the views of the bay? Amazing. I think I even swam in the water after landing at the Puntal beach for a break. The sense of freedom – being out on the bay – was exhilarating. I challenge anybody to feel otherwise. I don’t get out as often as I’d like to but each time is as good or better than the previous. 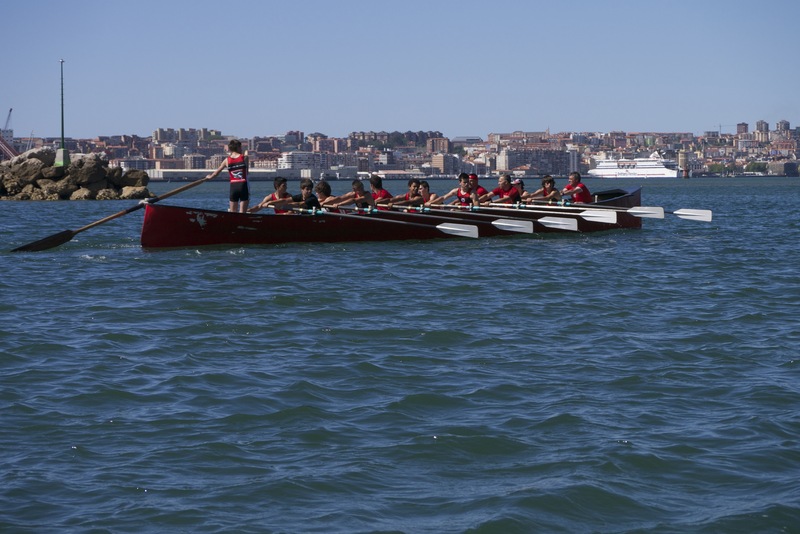 Have a look at some pics of this great tradition taken in Santander bay. I’m not sure I should have a favourite really but I do love the trainera. It originally came with a sail as well but that’s well in the past. The first time I saw it I was in awe. And I am still really. I’m also amazed at how easy it is to just hop in and row. (Of course, perfection is another thing altogether.) I’ve taken a few friends and family out and they’ve agreed – although most would have a bit of experience on the water. 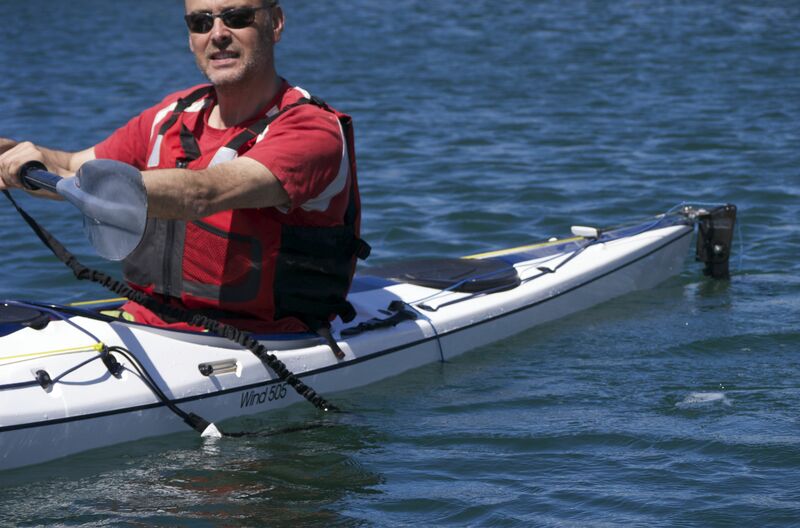 It feels a lot easier or more intuitive than on smaller boats. Maybe it’s the ‘safety in numbers’ thing. Some of the crew lining up for a nice stroke. You can just about see the roped rings or ‘estribos’ that attach the oar to the oarlock. And the smiles too! In case you can’t tell from the pictures, it’s big and it’s long. I haven’t actually taken out the measuring tape but they usually measure about 12m long (almost 40 ft), between one and two metres wide and weigh between 200-230kg. They cannot weigh less than 200kg for competing. As you can imagine, it’s a bit of a brute to turn over – which I haven’t had to do on too many occasions – thankfully. We have a cart to take it from the clubhouse to the water but when we take it out of town, it involves a few turnovers alright. Along with turning it over, the biggest challenge for me has been the fixed seat. In Ireland, I rowed with a sliding seat – like the ergometers you find in gyms. What’s the difference? Let’s just say that after a few hours stuck onto a wooden plank, you’re not feeling that comfy. It got a bit easier when I re-gained a bit of muscle in the stomach area (the three pregnancies had done for my abs) and the bit of extra foam we put down on the boards before travelling to Orio a few months ago is improving matters. The other challenges? Keeping in time – when there are seven rows in a boat – it’s easy to get out of sync. The weather also presents its own challenges. We don’t row when the wind is strong but when you are out for a few hours, it’s easy to find yourself dealing with a change in direction you hadn’t quite bargained on. As you’d expect with any boat, space is a bit tight at the front and the back bench has only room for one person (called the proel) who sits up quite high. I haven’t tried that position yet but I get the sense that you need to row downwards. Each position in the boat definitely has its own quirks and responsibilities. The person in charge of the crew is the ‘patron’ or cox. Duties include keeping time and order, marking the pace and steering the boat. And to do this last part, the patron’s oar is much longer and heavier than the others. It’s usually 5 metres long compared to between 3 and 4 metres. The patron’s skills really come into play when weather conditions change (you don’t want to be too far from base when that happens as a novice). It’s not easy trying to time a change of direction (called a ciaboga – watch it being done here in a regatta) between high waves. I stood in as ‘patron’ for a few minutes one day when the water was very calm and enjoyed the gondola-like feeling of standing up on the boat. You’d need to have a good sense of balance alright – and nerves of steel on the open sea. Does That Come in a Small? We don’t just row traineras. When there are more than 14 people or indeed when there are just a handful we mix and match with these other boats. And we always have a few canoes in our midst too. Five on the Danzon (the last rower is hidden) – enjoying the afternoon – especially when the sail went up! If you want to see more of the bay and the boats (and you don’t live here) try to see Seve – The Movie being released this month in the UK. It was directed by John-Paul Davidson and produced by Stephen Frears who are pretty big names in the game. It’s about the life of golfer Seve Ballesteros who grew up and sadly passed away in Pedreña in 2011 – where we row to from time to time. 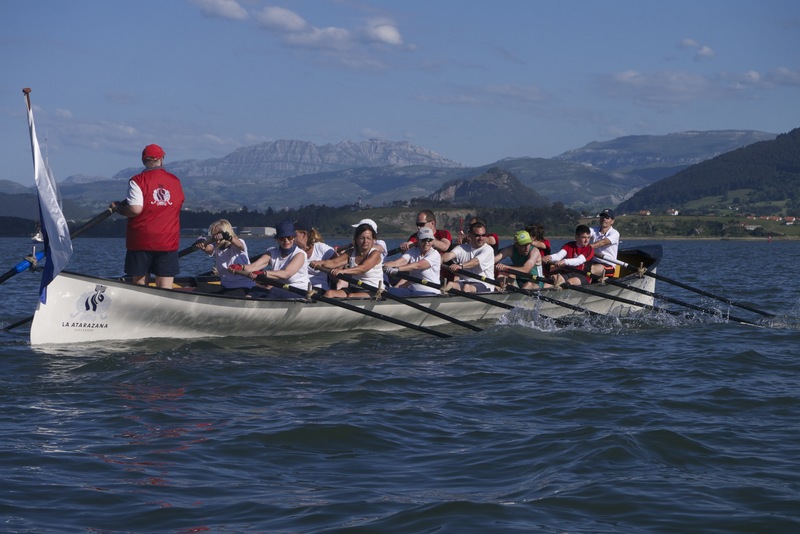 Keep an eye out for the scenes with Seve’s father rowing – that was our club’s trainera. 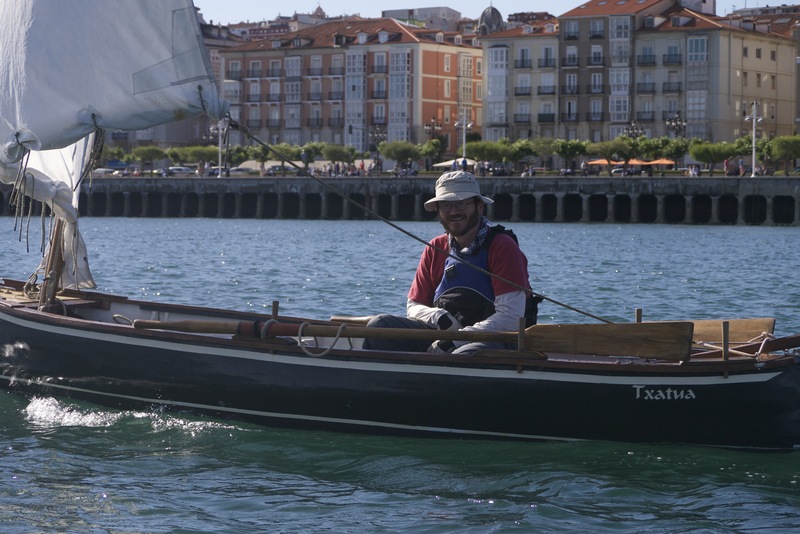 Two of the Catalan production team came out with us for a row last Autumn before filming started and went off with a few blisters and a fondness for the boat. I haven’t seen the film yet myself but I’m hoping the rowing scenes didn’t end up on the editing floor. Let me know what it’s like if you get there before me. It’s supposed to be quite like the Senna movie with a mix of news reels, documentaries and acting. 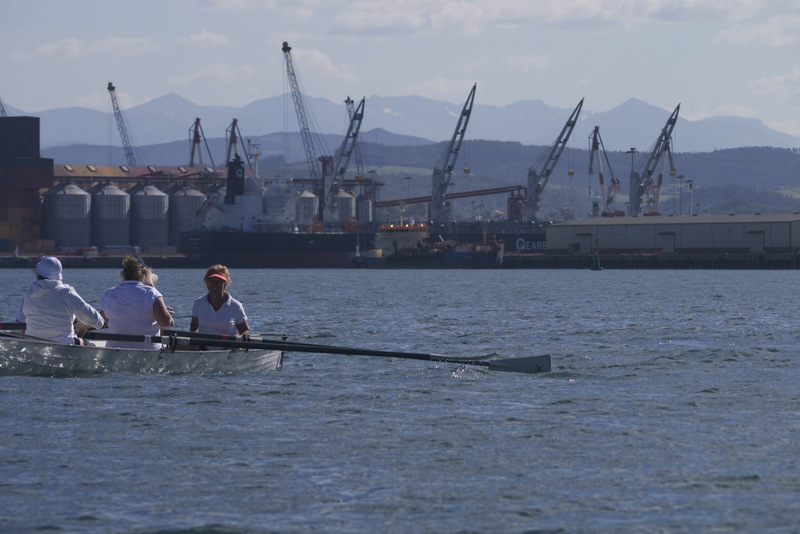 Rowing is one of the nicest ways of getting about while doing some exercise. 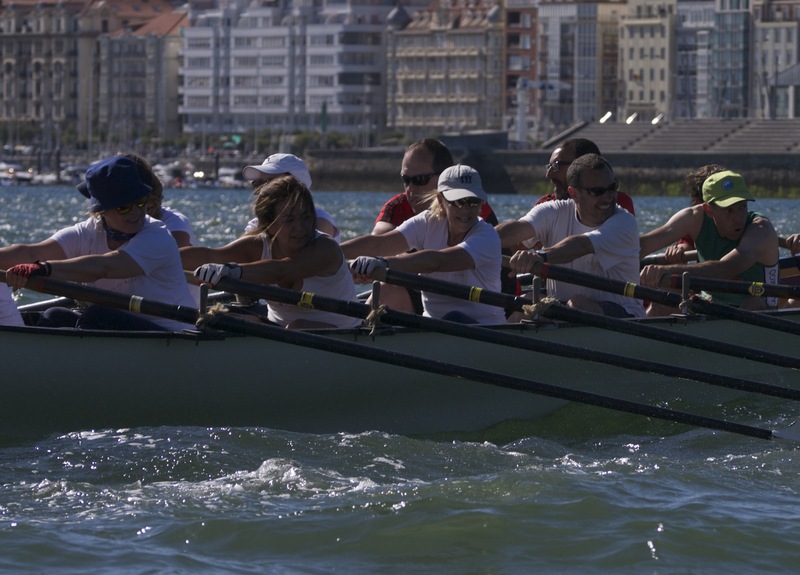 If you are in any way curious about traineras or rowing in general, I recommend you look up rowing clubs in your area. And if you are reading this in Santander, why not come along some day? 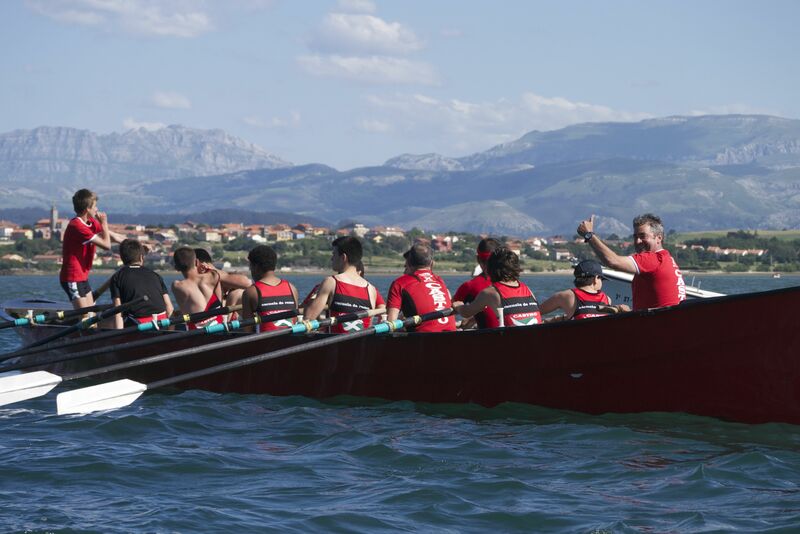 Although we did row in a competition earlier this year, we usually row for the pure pleasure of it – happy in the knowledge that we are preserving old traditions and skills – with a smartphone or two close to hand! I came across the club through Chepe Sáiz Cuesta – who spends his days plotting and planning ways to bring Santanderinos closer to the water. Whether he reels you in while talking about old skills and boats or wins you around with the ‘pan de barco’ crackers – he’ll encourage you onto the water alright. And the enthusiasm and friendliness of the rest of the crew will ensure you come back, again and again. 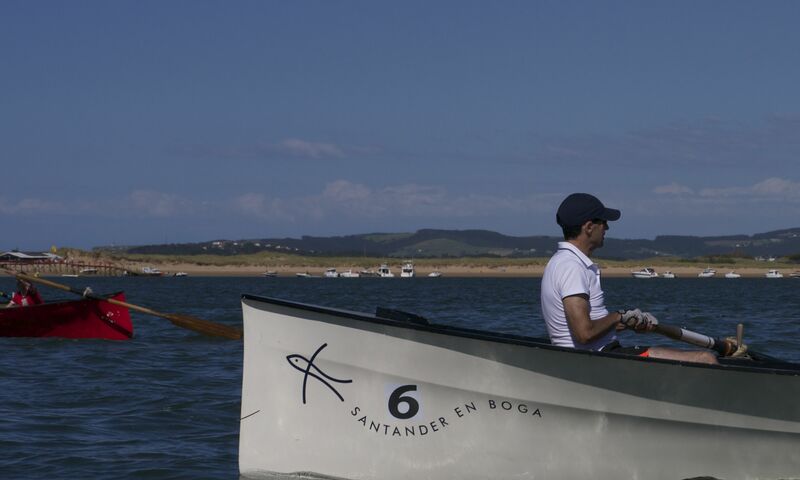 Check out the next rowing session on Santander en Boga and come along and introduce yourself. Me? I hope to be rowing for many more years to come and plan on dragging a new generation into this lark as well. Wish me luck! Thanks Barbara. It’s a great time of year to be out on the water alright! 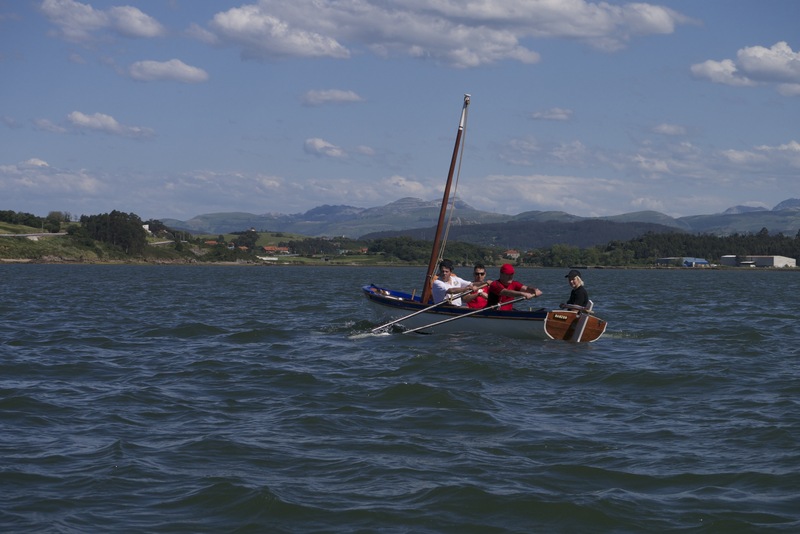 Amazing article about our popular traditions in Cantabria, Pam! Thanks I share it. 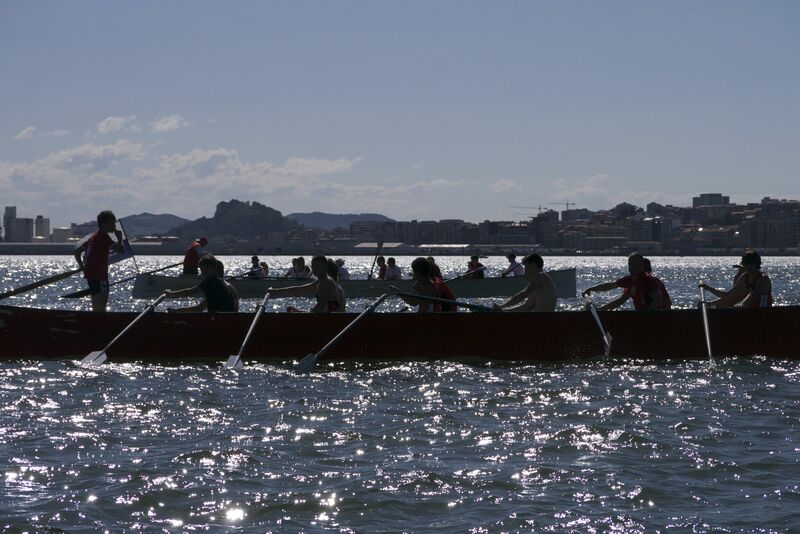 I’ve been interested in trying rowing even before moving to Bilbao…and after reading this, you’ve definitely piqued my interest even more. I love watching them practice in the Ría de Bilbao. I have to cross this off my bucket list soon! Hi Pamela – what a lovely piece. I had never heard of a trainera, such great boats. I have posted at my blog, rowingforpleasure.blogspot.com. Your club sounds very like mine, Langstone Cutters on the English south coast. We row antique Solent galleys, mainly for little excursions round the harbour to pubs or greasy spoon cafes, though we do compete occasionally – see langstonecutters.com. Hi, I’ve come accross your article via the “rowingforpleasure” blog. Can you enlighten me please as to the purpose of the bow man in the Trainera ? It seems odd to have six pairs, then one man on his own. Does he always row on the same side, or perhaps swap sides to aid turning ? This would be similar to the Cornish Pilot gigs which I row. The bow man normally rows on the port side (it’s a cornish thing), but as we rather absurdly row anti-clockwise around a course, when the buoy turn is sharp enough to merit the excercise, he lifts (tosses) his oar, whilst shifting position to the other side of the seat, and in one fluid movement (or more often not) places the oar on starboard side and pulls like fury around the buoy, reversing the process back to port side as soon as the turn is made. This is a very technical process when carried out in anger, and considering that the bowman usually only makes a maximum of five or six strokes on the opposite side during a turn, you have to get it spot on to make it worthwhile. Get it wrong and it can be a lot of messing for little benefit at best, or impede a whole side of the boat at worst. I hate rowing in the bow ! Hi Pamela, thanks for getting back to me. I was really interested to read your reply to my questions, I find all aspect of rowing (particularly traditional fixed seat) endlessly fascinating and your answers were far more comprehensive and interesting than I’d hoped. It seems the bowman and el proel serve very similar functions, a case of rowing parallel evolution I guess. I would dearly love to try rowing a Trainera, and if I’m ever in the locality I’ll let you know and try to find your club. The greater the variety of traditional boats I row, the more the pieces of the rowing jigsaw seem to fall into place. There’s always something new to learn. I was probably speaking a little tongue in cheek when I said that I hated rowing in the bow of a gig. The technical aspects of it are very satisfying to master, but it’s just the position itself which I have a problem with. There really is a LOT less space in the bow seat of a gig, and being a fairly large stocky guy who normally rows in the middle of the boat, I find it a lot less comfortable. Add to that the fact that there are thole pins (what we use instead of rowlocks) on both side of the gunnel in the bow seat, which tend to dig into your back if you’re somewhat broad in stature, and also the bow seat is quite a bit higher than the others (due to the shape of the bow) which gives me back ache on a long row, and you’re probably starting to get the picture.Sometimes, in heavy weather, it’s desirable to put more weight in the bow of a gig to help stop it rearing up too much in large waves and aid efficient forward progress, then people like me get the dubious honour of being “promoted” to the bow end of the boat. You may also be interested to know that a bow rower is employed when a gig is being sailed. Relatively few boats are built with the capacity to carry a sailing rig these days, but when they were a working boat almost all gigs could be sailed. They carry a very large dipping lug mainsail, with a small mizzen (usually gaff rigged) to help tacking. This is amazingly efficient downwind, so naturally would always be used if the wind favoured the desired direction of travel, as it’s a damn sight easier and faster than rowing. It is however not great for sailing upwind. 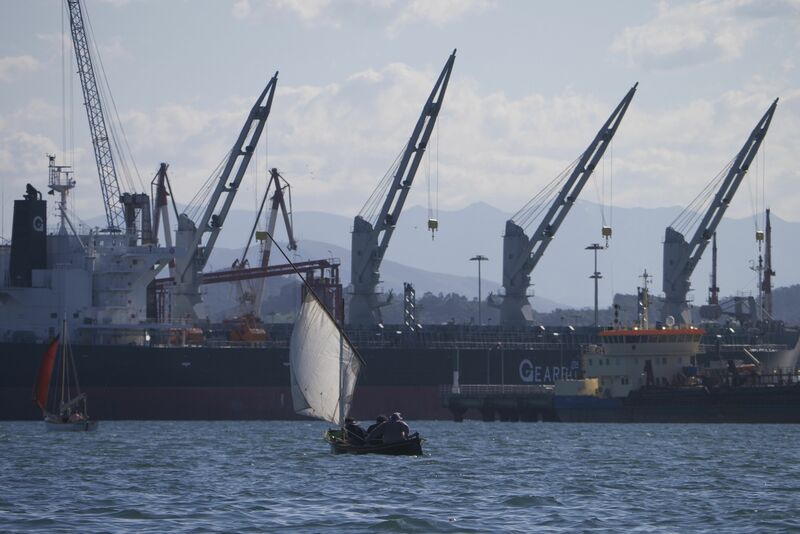 Tacks must be very broad, so progress into a wind can be pretty slow, and it’s then just quicker to row, especially if you were being pursued by a customs cutter and your cargo might not be totally legitimate. At one time, eight oared gigs were quite common, but were outlawed as, if caught by a customs cutter they’d simply row off directly into the wind and being that much faster, the cutters hadn’t a hope of catching them.Anyway the bowman is used when sailing because the dipping lug is quite cumbersome to manhandle when changing tack, which means that the boat could not sail “through the wind” as while the sail was being shifted from one side of the mast to the other, the gig would invariably come to a standstill, so the bowman would have to row like fury on the appropriate side to bring the bow of the gig through the wind and onto the new tack. Hope this is not all “too much information”, but it’s nice to exchange information with fellow rowers. 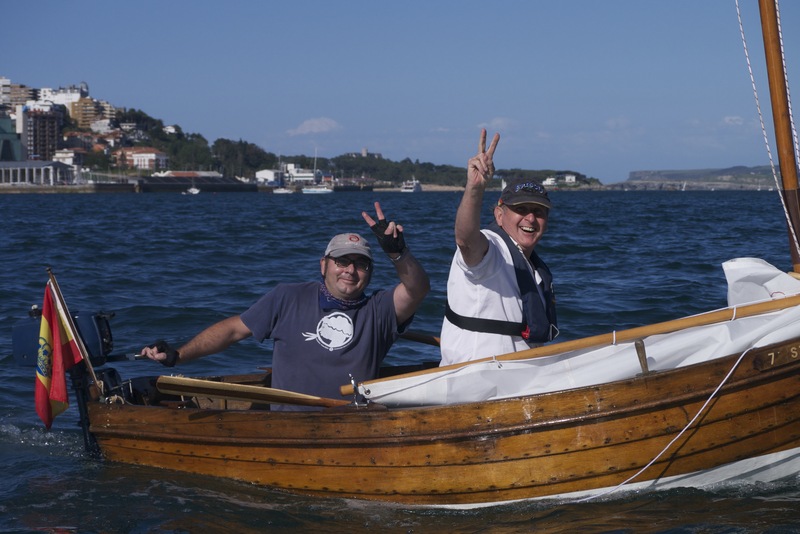 If you’re ever back in the UK and fancy trying gig rowing, there are now many clubs all over the South West, and even farther afield, as the Pilot Gig rowing gospel continues to spread. It’s worth checking out the CPGA (Cornish Pilot Gig Association) website as they keep a list of all the clubs in the country. Thanks for your very detailed reply Matt. I must give the bow a go and see how I find it! I really like your point about the rowing jigsaw – it’s great to learn about other boats and even trying the different styles of rowing. When there are too many of us for one trainera and not enough for a second, we take out a four with mobile seats and I find even swapping between these two styles is great to get different muscles moving and compare techniques. I’d love to visit one of the CPGA clubs – with the ferry connection from Santander to Plymouth, it’s not inconceivable to think that somebody from your side or ours could make the trip over! My partner and I are looking to relocate to Spain near to Malaga from Devon in England. We are very keen Cornish pilot gig rowers and train sometimes three times a week . 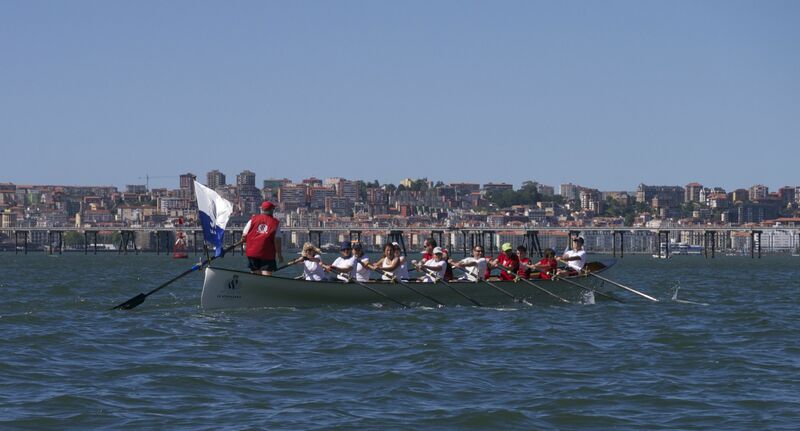 I am going to struggle with not rowing if we spend the winter months in Spain , do you know of any type of rowing that takes place in this area ( I guess the most similar to gigs) or maybe we should change our house search to elsewhere !! I just did a search on Google for rowing and Malaga and the ‘Real Club Mediterraneo’ in Malaga came back. Perhaps you should get in touch and ask them whether they accept new members and what boats they use. The website is http://www.realclubmediterraneo.com and you need to click on the ‘Remo’ link. They seem to operate at competition level and also offer courses in rowing so I’m sure somebody there can help you! I am getting a crew of rowers together to take part in a rowing festival in Finland. I have booked a 14 fixed seat longboat to race the 70km around the island at Sulkava. Our crew is mostly mostly Cornish Pilot Gig rowers, but would be delighted if a couple of Trainera rowers wanted to join us. At the moment, we have three or four spaces free but they are filling fast so a quick decision would be needed. Here is the link and youtube of the festival, it’s their 50th Anniversary so should be a good party. Its quite a long row, over two days so some stamina would be required. We are also looking for fun loving, easy going party animal types. The location is a 4 hour train ride from Helsinki but I can fill you in with details later. Let me know ASAP if you are interested.